January 8-12, 2018 | Philadelphia, PA – We had the pleasure of being hosted by the University of the Arts in downtown Philadelphia this week, with a talented group of undergraduate scholars majoring in art and design. 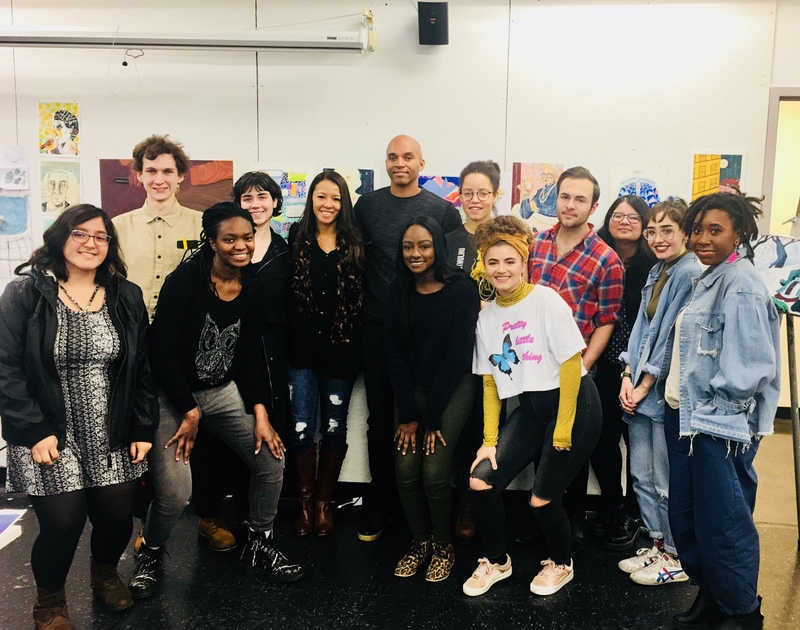 For one full week, I had the privilege of observing Kadir Nelson instruct a private master class to this distinguished group of students, and during the breaks I would tag team by mentoring the students in understanding how to hone their craft and translate it through strategic professional development. Overall, it was a fantastic visit at the U of Arts Philadelphia. Kadir gave an absolutely wonderful presentation to the academic and surrounding community on Monday evening. We were humbled that the theatre was nearly packed and that so many people battled the snow and ice to get there. The remainder of the week was absolutely more amazing than we had anticipated. The students came prepared to work, to brainstorm, and to put their creative energies into producing a strong piece for their portfolio — all in under a week! The growth and potential we saw within each of them was immeasurable and we are honored to have spent such quality time with these upcoming artists, who will certainly make their mark in the years to come! A special thank you to Edith Simpson, a pioneer who continues to sponsor the Master Class program at the University for the past several years. Stay tuned as we release some exciting news that was inspired by our visit this year!